If you're an established eBay trader looking for the next step or a new trader looking for a kick start then the Spiderscope eBay Optimisation Packages are for you. We offer a full eBay marketing service where we look at all areas of your eBay performance and develop a game plan that will push you to the next level. Ensuring your product descriptions are conversion focused and working for you. Optimising your listings to boost where your products position in eBay search. Developing long term tactics that will increase sales and ensure good positions are long lasting. Monitoring competition and responding effectively to keep you competitive. Increasing sales through well tested advanced strategies. Start today by completing our free eBay assessment form on the right. One of our eBay experts will review your listings and we’ll come back to you with specific ideas to help you. If you'd rather discuss your options over the phone, then please don't hesitate to contact us free on 03330 220 990. Professional eBay optimisation at low prices. Our optimisation plans are perfect for both new businesses and those with established eBay channels. Increase the number of potential customers you reach through eBay by using our proven strategies and marketing ideas to drive sales. 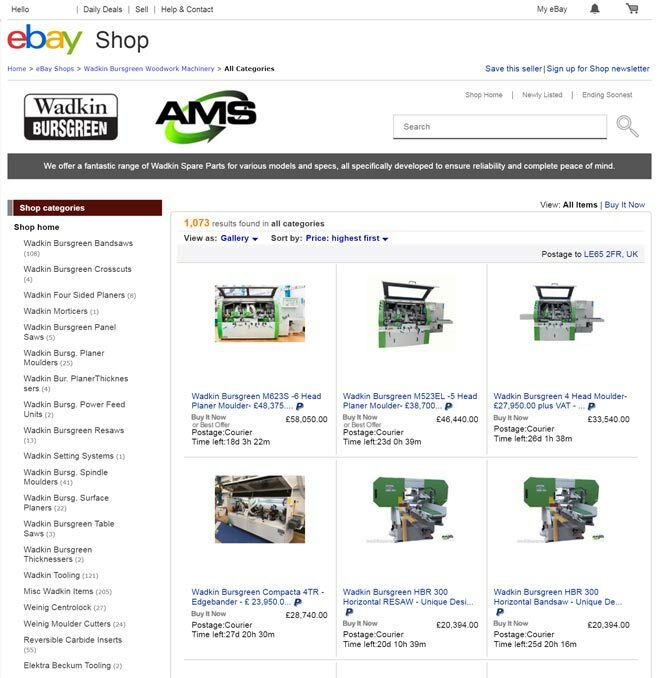 We will improve where your products position in eBay searches, putting your items in front of more potential customers. All of our customers have a dedicated account manager that will work with you to improve and optimise your eBay presence. All of our customers are given direct contact with one of our in-house eBay optimisation consultants backed up by an experienced and friendly team. Our primary focus will be achieving the best results specific to your business. Working together we set performance objectives and monitor results with one aim in mind- sustaining success. We know what it takes to deliver tangible eBay results. Over the years we've designed countless eBay stores for all manner of businesses. Take a look at a couple we've included below. Don't forget these are only examples, we can do a store to match any design! 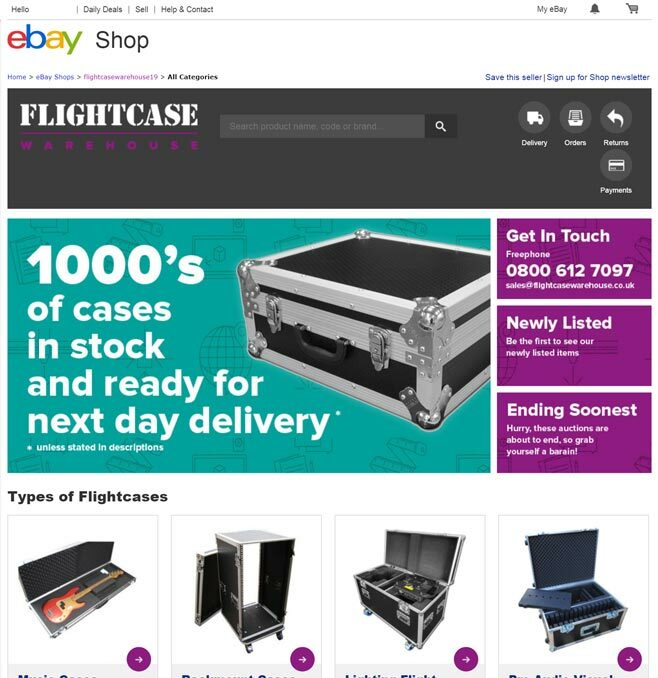 Specialing in the design and manufacture of custom built flightcases, The Flightcase Warehouse operate in numerous industries, from music to motorsport. 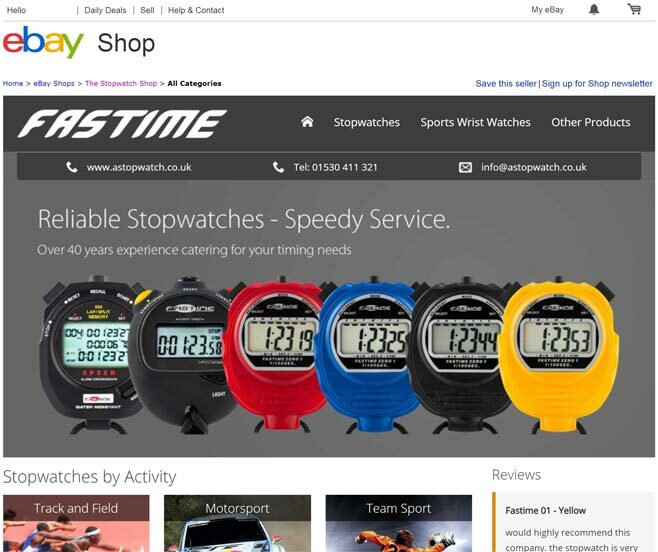 A leading stopwatch distributor with over 40 years experience in the design, selection and manufacture of stopwatches. Over 10 years experience in providing machinery and spare parts for production facilities and operations of all sizes - from the smallest of workshops to major manufacturing facilities. Our eBay optimisation packages are designed to deliver more sales. So, if you're already on eBay and looking to expand or an eBay starter looking to kick start your potential then contact us today by filling out the short form below!